How does the duchess look so chic in winterwear? The Duke and Duchess of Sussex just stepped out for a snowy outing in Bristol, England. They braved winter flurries as they greeted well-wishers and visited the city’s historic Old Vic Theatre. Chic no matter the weather, the former Meghan Markle wore suede, olive-green boots and a caped black coat, with a black, midi-length dress just visible underneath. The duchess also swapped her ballerina top knot from the previous day for loose, romantic waves. She accessorized with a simple, black scarf and a green, suede clutch, and she carried a pair of tan, suede gloves in one hand. Prince Harry, meanwhile, sported a gray overcoat and trousers, muted blue shoes, and a dark-gray sweater. 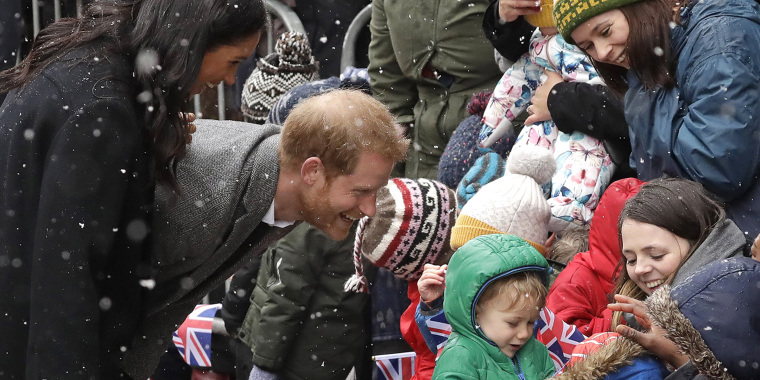 The scene was a winter wonderland as the duke and duchess chatted with the crowd and said hello to a group of children from the nearby Abbeywood preschool. Kensington Palace shared a cute video of the children bundled up against the frigid temperatures, waiting to meet the duke and duchess. Inside, the duchess removed her coat to reveal a black dress with a whimsical print. The snow definitely isn’t slowing down these royal parents-to-be during their busy day of engagements. After their morning appearance, they plan to visit Empire Fighting Chance, a charity that transforms young people’s lives through non-contact boxing. Snow or shine, the duke and duchess are a busy—and stylish—royal couple!